When I read this installment of Mac's Service Shop, in Popular Electronics magazine, the first thing that came to mind was my own experience with television interference (TVI) when I was a kid. In that case, the transmitter of my radio control system for a model airplane was the culprit. The frequencies and channels are almost exactly the same as reported in this infodrama. In the 1970s, citizen band (CB) radios operated in the 27 MHz realm, as did my R/C transmitter. During summer vacation from junior high and high school, I would run my model airplanes up down the street in front of my house, getting up just enough speed to lift off and then immediately chopping the throttle and landing. As soon as the transmitter was switched on, nearby housewives would lean out their doors and yell at me for screwing up "As the World Turns" or "All My Children." They were not particularly happy with noise from the engine, either. I eventually adjusted my operation times to avoid the afternoon soap opera prime time. Here is a web page showing the OS Digitron DP-3, 3-channel R/C system. Mac could hear Matilda's voice, shrill with anger, even before he opened the door. "I tell you, Barney," she was saying to the Number Two Technician of Mac's Service Shop, "I'm not going to have my lovely Englebert Humperdinck program ruined by any blabbermouth ham operating off his frequency." "Now don't lose your cool, Matilda," Barney said soothingly. "How do you know it was an amateur interfering with your program? Are you sure it wasn't a CB station? Did you hear any call letters?" "I certainly did," she answered, fishing a slip of paper from her purse, "and I wrote them down. They were KHD4167, and he was talking to a KLK something or other." "It was a CB station," Barney stated triumphantly. "CB stations have three letters followed by four numerals. U.S. amateur stations have one or two letters followed by a numeral and then two or three more letters." "What's all this about?" Mac asked, shrugging off his overcoat. "Has someone dared clobber our Girl Friday's dreamboat program?" But she refused to be teased into a good mood. "I'm going to do something about this," she warned. "I can't expect Barney to help me because he is a ham, but I thought I could depend on you, Mac." "Now just a cotton-picking minute!" Barney exploded. "Just because I'm a ham doesn't mean I go along with interference to radio or TV reception that is the fault of the transmitting station. I want to help you, too, but you've got to quit sizzling. Did you talk to the CB operator? He probably has no idea he is interfering with your reception." "That's right, Matilda," Mac chimed in. "Barney and I are on your side, but we need more facts. Come to think of it, Barney, this is probably a good time to continue that review of interference problems we started a couple of months ago. You'll remember then we talked about interference to radios, PA systems, electronic organs, etc. Suppose now we talk about television interference, or TVI, while Matilda listens for clues that may help with her particular problem." "I'm all ears." Barney agreed. Television Interference. "The basic difference between radio interference and TV interference lies in the receiving frequencies involved," Mac began, lighting his pipe. "The radio broadcast band lies below the frequencies on which amateur and CB stations operate, while the TV channels lie above the frequencies of most amateur and CB stations. Also most radio receivers have an i-f frequency of about 455 kHz, while TV i-f frequencies are likely to be near 41 MHz, with older sets having i-f's from 21 to 27 MHz." "I think I get it," Barney said slowly. "Radio interference almost always results from a lack of selectivity in the receiver or its propensity to respond to spurious signals, such as true images or harmonic images. But TV interference often comes from a transmitter putting out appreciable amounts of power in the form of harmonics, or multiples of the fundamental frequency, that fall in a TV channel. In such a case, nothing done at the receiver will help. The harmonies must be attenuated at the transmitter itself." "That's right. While the fundamental frequency of a ham station at 21 MHz might possibly get into the i-f of an old TV set because it was not properly shielded, the third harmonic of such a signal will fall in Channel 3, 60-66 MHz, and the fourth harmonic in Channel 6. 82-88 MHz. A 28-MHz ham station may have a second harmonic in Channel 2, 54-60 MHz, and a third in Channel 6. A CB station operating in the 27-MHz band can have a second harmonic in Channel 2 and a third in Channel 5, 76-82 MHz. These harmonics constitute actual signals appearing in the TV spectrum, and there's no way a receiver can differentiate between them and a duly transmitted TV signal. Other higher order harmonics fall in the upper vhf, channels 7-13, but ordinarily they are too weak to cause trouble except to nearby receivers picking up weak telecast signals." "Does an unwanted signal cause the same amount of interference, no matter where it falls in a 6-MHz TV channel?" "No. The worst interference results when the interfering signal falls near the picture carrier, 1.25 MHz from the low edge of the channel; the color subcarrier, 4.83 MHz from the low end; or the sound carrier, 0.25 MHz from the high end. In the first case, interference blacks out the picture entirely, makes a negative of it by reversing the light and dark areas, or produces bars and cross-hatching in the picture through beats between the harmonic signal and the picture carrier. In the second case, there's breakup of the color. A harmonic falling near the audio carrier interferes with the telecast sound. The degree of interference usually depends on how near the interfering signal is to one of these sensitive frequencies." "Then TV interference is almost always the fault of the transmitting equipment!" Matilda said triumphantly. "Whoa now! I didn't say that. I said such a possibility exists with TVI but it is not present with radio interference. A 'clean' transmitted signal with spurious radiations attenuated far below FCC requirements can still cause interference in a TV receiver by overloading stages in the front end, by cross-modulation, or by means of harmonics generated outside the transmitter by some non-linear device. In all these cases; the fault is not in the transmitter. "Front-end overload is very common when the TV receiving antenna is quite near the transmitting antenna or in the beam of the latter. When an r-f stage is overloaded, it operates nonlinearly and generates harmonics that are difficult to differentiate from transmitted harmonics. However, a properly installed high-pass filter at the TV tuner will greatly attenuate all signals below 54 MHz and usually cure front-end overload, but it will not affect transmitted harmonics. On the other hand, a low-pass filter installed on the transmitter output will attenuate harmonics that affect TV reception. So will proper bypassing, shielding, r-f choking, etc., but we can't go into measures taken to prevent the radiation of harmonics by ham or CB transmitters. There are books devoted to that subject." "Don't forget a strong nearby signal can get into the audio amplifier of a TV set just as it does with a radio, PA amplifier, or any other audio amplifying device," Barney suggested. "A high-pass filter mayor may not help this. That business of an external non-linear device producing harmonics is a rough one. The device can be any oxidized joint between two pieces of metal, such as downspouting, electrical wiring shielding, a metal clothes line, joints in a metal tower, a bad lightning arrestor, or what have you. Often the condition is intermittent, to add to the confusion. 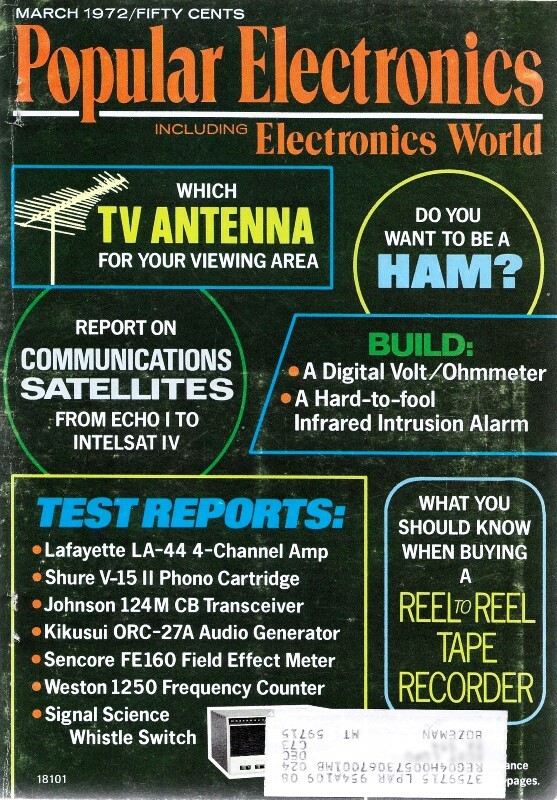 The Radio Amateur's Handbook published by the ARRL is probably the best down-to-earth source of information on the cause and cure of all kinds of TVI." "All very interesting - I think - but it doesn't solve my problem," Matilda said impatiently. "Was the interference only with the audio or was the picture messed up, too?" Mac asked. "Did you try other channels? If so, were they OK?" "The picture was not disturbed, only Humperdinck's lovely singing. Other channels were fine, but only Channel 5 carried Humperdinck." Mac did a little figuring and then made a telephone call. "Now we're getting somewhere," he announced as he returned to the desk. "CB Channel 23 on 27.255 MHz has a third harmonic on 81.765 MHz, only 15 kHz away from the sound carrier frequency of Channel 5. A CB friend I know tells me the call letters you heard belong to a man living directly across the alley behind you. Here is his name. The local CB club has a TVI committee, as does the local ham club, and they will call you shortly and set up a time when they can run some tests and see where the fault lies: in his transmitter, your receiver, or neither. Then they will do what they can to correct it." "What if his transmitter is at fault but he'll not do anything about it?" A Last Resort. "In that unlikely event you can, as a last resort, send a complaint to the FCC in Washington, D. C. giving the name, address, and call letters of the person causing the described interference. If he is not licensed, they will send letters to him and to you. He will be given your name and address and the nature of your complaint and will be requested to contact you for the running of tests. He will be requested then to make a complete report, covering items as his transmitting equipment and your receiving equipment, the tests he ran and the results, the measures he took to correct the condition and the success he had, your attitude, and the distance you live from the TV station being interfered with. "If you are the only person in your neighborhood experiencing interference or if you are trying to receive a TV station beyond normal good-reception distance, the FCC probably will consider your complaint unreasonable and do nothing about it. On the other hand, if the transmitting station is causing widespread interference to the reception of good signals, the owner may be mandated to observe silence during prime viewing time until the condition is corrected Note, however, that lodging a complaint does not mean the offending station is going to be automatically 'taken off the air.'" "It might in one case," Barney offered. "If that station is operating illegally - is not properly licensed, has an antenna higher than the legal limit, or is running more power than permitted - the operator may be subject to a stiff fine. If he uses profane or obscene language over the air, this is a federal offense and the fine may be as much as $10,000, accompanied by imprisonment. A station operating illegally certainly does not want the FCC monitoring truck parked in his alley." "It's' far better to settle the complaint at the local level," Mac pointed out. "A complaint sent the FCC usually means neighbors become enemies; yet they still must cooperate to clear up the trouble." "One more thing," Barney interrupted. "Yes?" Matilda questioned, her pencil poised. "Don't call CB operators 'hams.' They are two entirely different kinds of cats!"